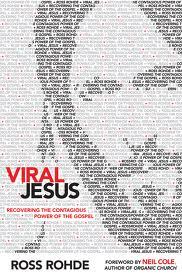 This is my personal review of “Viral Jesus” by Ross Rohde. You can also find this review posted online at Amazon.com and Barnes and Noble. In the interest of full disclosure, Ross was kind enough to provide me with a free copy in exchange for an honest review of the book. Christianity was designed to spread like a virus, moving from person to person, contact point to contact point, quickly changing people and making them an agent of change. That all came to an end after a sustained period of growth several hundred years after Jesus’ resurrection. The church slowly abandoned it’s commitment to the “epidemic principles” they were founded on and adopted a different method of living. This is the premise of Ross Rhode’s new book, Viral Jesus. According to Rhode, though, these “epidemic principles” can be recaptured and a viral Christianity can again become the norm. I had been eagerly anticipating the release of Viral Jesus ever since Rhode began blogging at Viral Jesus a few years ago. If you’ve read the blog or enjoy the missional house church/ organic church/ simple church discussion, you will certainly find an enjoyable read in this book. But this is not just another book about doing house church. This is a book about spreading the Lordship of Jesus throughout a society, something that house churches become a vehicle for. This is a radically different approach than most “house church” books take, but it was incredibly helpful. I want to offer one warning up front before I continue with the review: Do not read this book if you’re looking to transition into a new church fad. This book is fairly unique and it will not give you step by step instructions for getting new converts. This book presents Jesus Christ as Lord, both of the world and of the church, and that means you won’t find strategies that work apart from Him. Rohde takes a lot of necessary time presenting this truth and because of that, someone only wanting change without prayerfully submitting to Jesus would get very frustrated. But if you desire to follow the real Jesus into His harvest field, this book will be both incredibly helpful and challenging, but well worth the read. The first obvious strength of this book is the fact that it presents Jesus as the operating system for life, both inside and outside the church. This is not a how-to book. It forces you to acknowledge the ways in which you’ve been dependent on other things besides Jesus, especially in the church. Rohde significantly develops the idea of “Jesus as Lord” that Hirsch and Frost discuss in books like “The Shaping of Things to Come” and “The Forgotten Ways.” But instead of developing the theology of “Jesus as Lord” Rohde presents very tangible examples from Scripture and experience of “Jesus as Lord” playing out in the life of the church. One of the things I appreciated in the book was it’s strong endorsement of supernatural phenomenon in the life of Jesus movements. Most of the current books on church planting and organic church argue for returning to most of the principles of the book of Acts, but spend little or no time discussing the place miracles plays. This is confusing because it is one of the most prominent features of the early church. I suspect that because Rohde truly believes that the Lordship of Christ is the issue for viral Christianity to be restored, he has no problem presenting the Holy Spirit as active and involved if we submit to Jesus. I can’t emphasize enough that these two issues need to be stressed over and over in the organic church conversation, and that fact alone makes Rohde’s book an invaluable contribution to the discussion. Another strength of the book are the multiple stories Rohde tells about the adventures he and his co-workers have in the harvest field. These stories take place in locations where many people think the Gospel is irrelevant, hardened Western Europe and California, and they make the principles Rohde lays out believable. I’ve heard plenty of stories about miracles and conversions happening in America and Europe, but Rohde tells the stories in ways that make everyone believe they are capable of doing the same. He and his friends aren’t the heroes of the stories, Jesus is, and because of that you gain faith you can participate in similar stories yourself. Finally, Rohde’s chapters on Viral Evangelism and Viral Church Planting are worth the price of the book. Both chapters are a look at how, once submitted to Jesus, a believer is typically led by Him to share the gospel and see churches started. Rohde makes evangelism and church planting a joy, not a burden, and accessible to everyone. I’m actually going to list this book in the evangelism section of my Amazon bookstore because it so easily encourages and trains believers in basic principles for sharing their faith and planting churches. The one weakness I found in the book is it’s treatment of the historical Jesus movements of the past. Rohde traces the fall of the early church away from the “epidemic principles” it was originally founded upon. He then looks at times throughout history most Christians would call revivals and dissects how these revivals missed turning into full-fledged Jesus movements that God had intended. I think this is the point where most Christians would have problems. However, I actually agree with Rohde on most of the issues he presents as problems. Rohde argues that each of these revivals were short-circuited because they didn’t completely abandon the trappings of Christendom that they emerged out of. Because of that, these revivals eventually died down and became trapped in a dead religious state that they had been awakened out of. I don’t even disagree with Rohde on this point. However, what was written seemed to imply that even though God moved powerfully many different times, these Jesus movements continually fell back into the Christendom mindsets they emerged out of. Can a viral Christianity emerge in a country where Christendom is present and operating? I believe it can and I even think Rohde believes it can, but I walked away from the chapter having to truly process these thoughts out. In the end, I believe that even this was helpful, because these chapters forced me to examine where I’ve compromised with foundational principles of the world in my Christian experience. But my hope is that even though much of Christianity in the West is still steeped in Christendom, that viral Christianity lived out in front of the rest of the church will actually convince the church of the validity of abandoning many of the Christendom principles it has built itself on. Should You Read Viral Jesus? Yes, yes, and yes! You will be encouraged, stretched, and challenged in ways you cannot imagine. Rohde is really balanced in a radical, Jesus-following way. Reading this book will push you in the most healthy direction you’ve been pushed in awhile—closer to Jesus. If you’ve never been part of an organic church this a great book to get you started. If you’ve read every book by every guy about church planting movements and house churches, this is still a really helpful and inspiring book. And this is not a book for leaders, it’s a book for everyone, because viral Christianity is for everyone. Because of all of this, I want to recommend you pick a copy of this book, take a journal and a Bible with you, and go and wrestle with the issues Rohde presents. My hope is that it causes Jesus movements to spring up throughout the West and changes Christianity as we know it. An excellent review! I am just now finishing up Viral Jesus and have benefited greatly from its content. I, too, found the section on the supernatural to be especially relevant to the contemporary church. Mick, thanks for stopping by and reading the review. I’m really glad you liked it. I checked out your blog and was really impressed with your article “A Fresh Wind is Blowing.” Love to see you around more often.